What could be better than lying in a park with friends and watching a good film on a cinema screen? 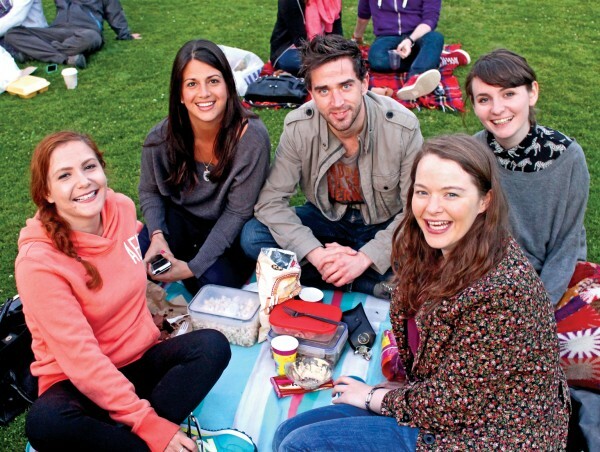 On warm summer evenings in Dublin, and elsewhere around the country, there have been people enjoying just such a privilege, with music before and after the film, picnics and food stalls for those who didn’t bring their own, all courtesy of Happenings. Happenings is the brainchild of Peter O’Brien, who has been running open-air cinema and other events since 2009. On their Facebook page, a couple of days beforehand, they announce the venue and line up, and all for a lot less than the price of a normal cinema ticket. O’Brien is an activist, but one who does it with wit and charm, as he believes that is the only way to really get through to people. The environment, and our treatment of it, is the issue dearest to his heart. One of the ways he raises awareness of this is through his “leave no trace” policy. Before the events, he explains to the crowd that everything that enters the event area has to be taken away afterwards, right down to cigarette ends and bottle caps. At the events NewsFour attended we witnessed people staying to clean up after the movies and other entertainments had ended. O’Brien himself often stays until the small hours to finish the job properly, but it is getting noticeably better as the regular attendees learn to tidy up automatically. “Paddy’s Day Unlocked is another event we do that we hope will have a positive effect,” O’Brien says. The unlocked bit is the key here, as these are events where drunkenness is not encouraged. Over 3,000 people attended it in Limerick this year and next year it will be held in Temple Bar, Limerick, Cork and maybe even New York. “The idea of being able to celebrate St Patrick’s Day without being bothered by very drunk people is something of a revelation in Ireland, and something we hope will spread”. The only problem Happenings is experiencing is that their audience is getting too big. As a result, they will be reducing the amount of notice they’re giving before events and are talking to Dublin City Council about using Merrion Square and other larger venues. If you would like to keep up to date with Happenings see their Facebook page for details. Above: Kerri McGuigan Ana Mova Mark Lyons Ciara Ni Fhlionn and Karen McLaughin sit out with a picnic. Below: Peter O’Brien gets ready to show the movie in Fitzwilliam Square.